Is finally writing that family history one of your goals or resolutions for 2013? 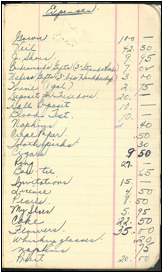 For many genealogists, getting started is the hardest part. For others it's finding a focus, or feeling that burst of inspiration to put pen to paper or fingers to keyboard. In July 2012, I wrote an article, "Break That Writer's Block: Ten Tips To Tap Into Your Creative Muse." There have been a number of other excellent articles over the past few months in the Expert Series about the writing process, including: "Why We Don't Write, and How We Can," by Harold Henderson, and "Getting Creative: Using Genealogy to Teach Writing Skills," by Stephanie Pitcher Fishman. But if you're still in search of some motivation, here are six more ways to find your family history muse. Search your documents and photographs for details you can use to "jumpstart" your story. Study a census record. Review that last will and testament. Look through family keepsakes. 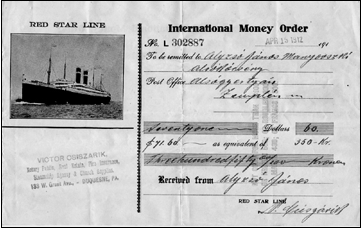 For example, my cousin found an International Money Order that my grandfather sent back to his parents in Kučín, Slovakia in 1912. This gem was tucked away in a stack of other papers belonging to my aunt. My cousin scanned it and e-mailed me a copy. This little receipt has some interesting details that I've used to write a narrative about how my grandfather helped his family purchase some land that's still maintained by the Alzo family today. 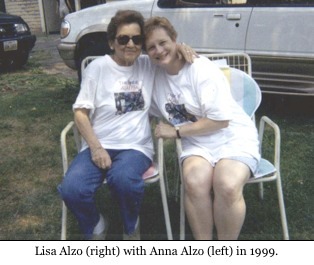 You can read more about this story on my blog, The Accidental Genealogist. No, I'm not suggesting you admit you are hearing voices or talking out loud when there's nobody there. (But, please know I certainly won't judge you if you do.) What I do mean is to listen to what your ancestors are telling you in the records they left behind. Perhaps you're lucky enough to have your great-grandma's diary, or maybe an audio or video recording of your father or uncle talking about his service in World War II. Some of my most treasured possessions I have from my mother include the little brown book where she wrote down the expenses from her wedding and other notes, and the six audio tapes of the interviews I conducted with her during research for my first book, Three Slovak Women. I've used these treasures as inspiration for writing articles, blog posts, and more. Creative nonfiction is a genre of writing that uses literary styles and techniques to create factually accurate narratives. The genre has a fundamental principle of "Show, Don't Tell." A few of the pioneers of this field include: James Baldwin, Truman Capote, Ernest Hemingway, and Tom Wolfe. Read some of their works for inspiration. Then try to find the best ways to take the information you've gathered about your ancestors to build a good plot structure. Think before you describe--try to incorporate details that appeal to the five senses. Use dialogue where appropriate--often a speaker's exact words tell the best story. Think of your ancestors as characters. Go beyond the boxes and lines. Strive to avoid making your ancestors appear one-dimensional. Give us the whole story--show their strengths and weaknesses, their successes and blemishes. Follow the "Show, Don't Tell" as you strive to write a family history your relatives and descendants will want to read. Don't just tell us that Grandpa escaped from a Russian prison camp during the war--show us. In one of the chapters in Three Slovak Women, I let my mother's words tell the story about how when she was a young girl her father (my grandfather) disciplined her for taking $12 from him to treat a friend to ice cream. The incident had a profound effect on how she viewed him for the rest of her life. My mother's quotes from the interviews I conducted with her provided a key emotional impact and connection that went beyond a simple summary. One of my favorite writers is John McPhee. In a recent column for the New Yorker, McPhee wrote about story structure and how to "build some form of blueprint before working it out in sentences and paragraphs." This step will work whether you're writing a profile about your ancestor, an article or a book. You can plan the structure of your story with an outline, a simple flow chart, a mindmap, a set of 3 x 5 index cards pinned to a corkboard, or online tools, apps, or software that enable you to create "virtual notecards." The objective is to jot down the main events of the incident you are telling, then arrange them in chronological order (first to last). If you need to, you can then move them around to into another structure that makes sense for the story, such as flashback, flashforward, etc. My favorite way to write is using the virtual corkboard or notecard system. Two tools I rely on are Scrivener (available for PC $40 and Mac $45) which has a ton of features including the ability to set up your projects in storyboard format (a free 30-day trial is available), and Trello, a free online project board (you can sign up for an account, or log in using an existing Google account). If you just can't find a way into the story about great-great-grandpa's Civil War heroism, then try writing out some key words, or points, or even just a few basic sentences. Don't worry about perfection here. Just get some words on the screen or paper. You can go back and expand on the points later and worry about perfecting your prose during the revision process. Another good way to break through the mental barrier is to write something else--perhaps on a topic that's totally unrelated. Try the 12-day simple plan of writing exercises outlined on the Writer's Digest website. These simple and effective exercises should help get your creative juices flowing and perhaps give you some new ideas or insights into your project. Set some deadlines or challenges to push yourself. Perhaps it is 500 words a day, five pages per week. Do whatever works for you. Join a writer's group to get feedback and encouragement. Look for them at your local library, community college, or library, or online (for example, there is a Family History Writers Group on Google Plus). Sign up to participate in the Family History Writing Challenge (happening during the month of February) over at the Armchair Genealogist Blog. Read how-to books, take classes, attend writer meetings and listen to what other writers offer as advice. Ray Bradbury said, "I'm not in control of my muse. My muse does all the work." The next time you're staring at the blank page, or blinking cursor, try the above tips and hopefully your muse will work for you!